The editors of the acclaimed new book about Austin’s iconic underground newspaper speak and sign books on Thursday, January 5. Thorne Dreyer, left, Alice Embree, and Richard Croxdale, editors of Celebrating The Rag, will appear at Book People, January 5, 2017. 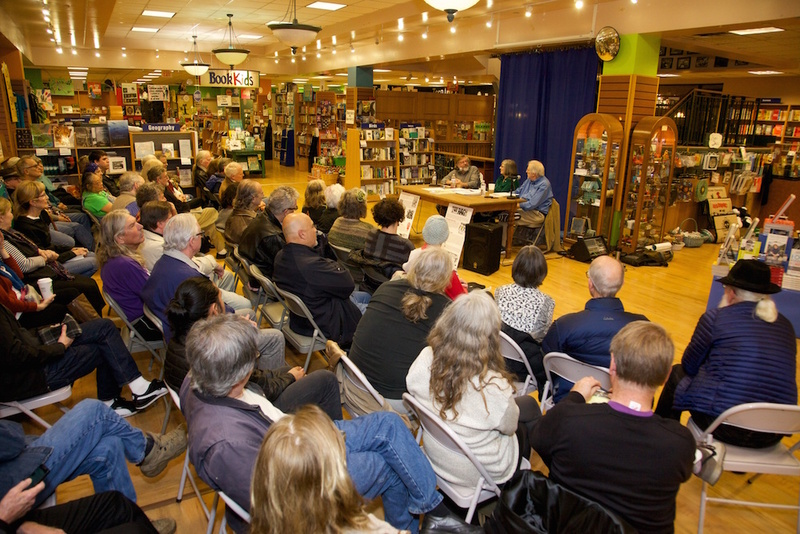 UPDATE: The event at BookPeople was a tremendous success, with an enthusiastic overflow crowd. Celebrating The Rag editors Thorne Dreyer, Alice Embree, and Richard Croxdale spoke, led discussion, and signed books. Artist Kerry Awn and photographer Alan Pogue also offered some memories and joined in the signing. The event was rebroadcast on Rag Radio. Listen to it here. Celebrating The Rag at BookPeople, Friday, January 6, 2017. Photo by Alan Pogue / The Rag Blog. 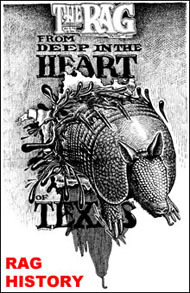 SECOND CHANCE: There will be another event, this one at the Austin History Center, 810 Guadalupe St., Austin, from 2-4 p.m., Sunday, February 19. Dreyer, Embree, and Croxdale will speak and Glenn Scott will introduce a partial screening of People’s History in Texas’ documentary film about The Rag. It will be free and open to the public. 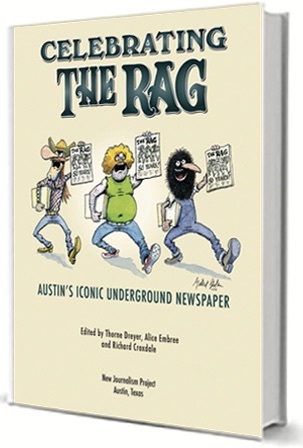 When: Thursday, Jan. 5, 2017, 7 p.m.
AUSTIN — Thorne Dreyer, Alice Embree, and Richard Croxdale, editors of the new book, Celebrating The Rag: Austin’s Iconic Underground Newspaper, will speak and sign books at BookPeople, 603 N. Lamar in Austin, on Thursday, January 5, 2017, at 7 p.m. Copies of Celebrating The Rag will be available for purchase at the event. Celebrating The Rag tells the remarkable story of the legendary underground newspaper that sparked a political and cultural revolution and helped make Austin weird. The book features more than 100 articles from The Rag’s 11-year history, plus contemporary essays and vintage art and photography. This collection captures the radical politics and subversive humor that marked the pages of this upstart newspaper between 1966 and 1977. The story of radical Austin is the story of the renowned underground newspaper The Rag. The stories in the Rag brought radical thought, action, art, belief, and protest to the Austin public in the 60s and 70s, when independent thought along the Drag was both desperately needed and heartily welcomed. The Rag was a pipeline of information and ideas to other hotbeds of creativity and unrest, and Celebrating the Rag is both a beautiful volume and a fitting tribute to the wacky original. Join editors Thorne Dreyer, Alice Embree and Richard Croxdale in honoring an iconic Austin publication. 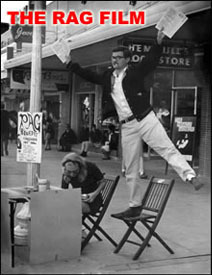 Thorne Dreyer was the original “funnel” of The Rag in 1966. 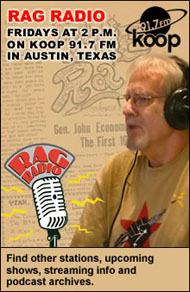 He now edits The Rag Blog and hosts the syndicated Rag Radio program. Austin activist Alice Embree, a veteran of the women’s movement and progressive politics, worked with the paper through much of its history. Richard Croxdale, who was involved in The Rag‘s later years, is a producer of People’s History in Texas’ documentary film about The Rag. Celebrating The Rag can be found in Austin at BookPeople, BookWoman, Antone’s Record Shop, and all Planet K and Oat Willie’s stores. It can be purchased online at Lulu.com, Amazon.com, and Barnes & Noble, and is available through Ingram. BookPeople is the largest independent book store in Texas. Go to the Facebook event page here. See the event post at BookPeople here. See Thomas Zigal’s Rag Blog review of the book here. This entry was posted in Metro and tagged Alice Embree, Austin History, BookPeople, Booksigning, Celebrating The Rag, Metro Events, Richard Croxdale, The Rag, Thorne Dreyer, Underground Press. Bookmark the permalink. Had a question for Richard which I did not ask. When he spoke of the early 70’s disillusionment w/political change coupled w/a retreat into a cultural bubble of listening only to ‘friendly’ people & media, how does that compare & contrast with today’s “epistemological isolation” as practiced by many Trump supporters & xtians? My guess it’s about the same thing only with a lot more $$$. The funny part is that the Donald’s mansion in FL & many of his worldwide properties are very close to sea level & as the ocean’s rise (due to the ‘myth’ of ‘global warming’) it will be difficult for him & his minions to deny same when the ocean reaches his properties and is lapping at their feet. Now I’m glad I didn’t go. Is there any space in Austin that is safe from whites with antique axes to grind? The discussion at BookPeople was upbeat and our book is an homage to the important historical role played by The Rag. We ground no antique axes. If you’re referring to the remarks above by “darms,” his short comment came during the Q&A session after the editors’ presentation. Incidentally, there was a large and receptive audience. We had a lot of fun. Thanks. Yes it was in regard to darms. I like the Rag bunch. It doesn’t appear that the Tea Party folks have the same in-fighting issues that the left seems to have which means they are effective while we are not. Can you share some insight into that or are you yet another one of the ‘leftier than thou’ folks? Let’s meet up at the march on J20. We can arm wrestle with our left hands. Then let’s shut down the bridge-all of us. Together.